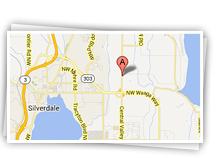 Central Valley Animal Hospital is a full service, locally and family owned veterinary hospital located in Poulsbo, Washington. We are proud to offer a wide range of services using state-of-the-art technology and provide personalized service to families based on their individual needs. Our services include canine and feline wellness care, dental care, diagnostic services, behavior consultations, nutrition and diet recommendations, dermatology care, laser surgery, and microchip implantation. We also have an in-house pharmacy and provide refills of your pet’s prescription medications and therapeutic diets. As part of our commitment to you and the health of your pet, our hospital is equipped with digital radiography and a complete diagnostic laboratory to provide you with fast results, often while you wait. Our veterinarians and staff routinely attend advanced seminars and classes to provide our patients with the latest advances in veterinary medicine, surgery and pet dentistry. At Central Valley Animal Hospital, we work as a team to ensure that your dog or cat always receives the most compassionate care possible, and we are committed to treating our patients and their families as we would treat our own. We would be delighted to be your other family doctor! Copyright © 2019 Central Valley Animal Hospital. All rights reserved.